When I saw this aircraft coming out I just had to buy it. 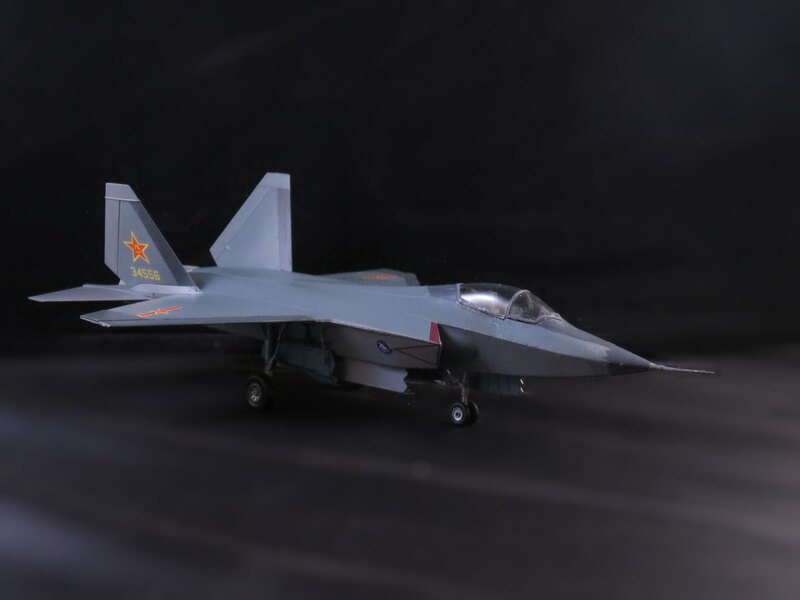 There is so much chatter about this aircraft around, accusations of stealing files from the F-35 programme have made this aircraft infamous in the West. 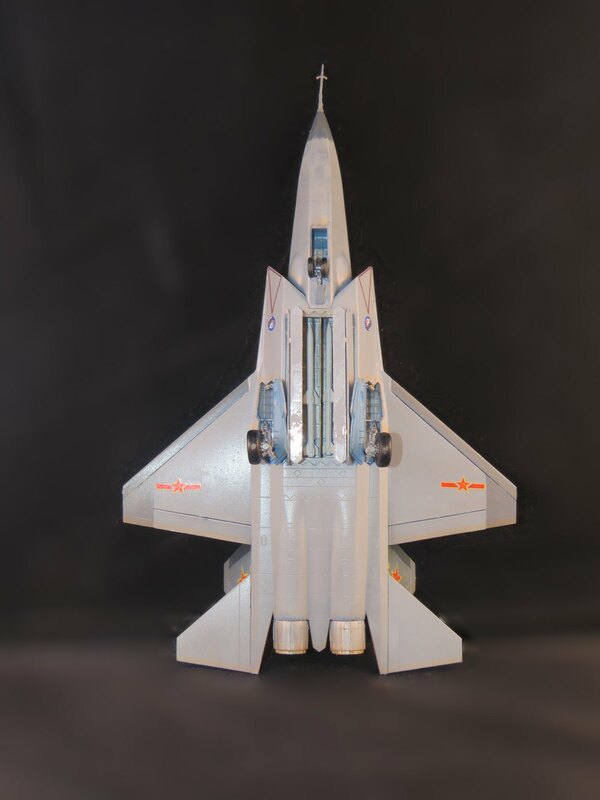 I’ve not built an F-35 yet, but anyone can see the resemblance. At this point, China is well known for this in their modern arsenal (the IAI Lavi as the J-10, and some expect the MiG 1.44 for the J-20). The J-31, though, does not have VTOL characteristics of it’s American counterpart. Nor the efficient engines – at least, not yet. The box is the standard affair for gorgeous Trumpeter kits. 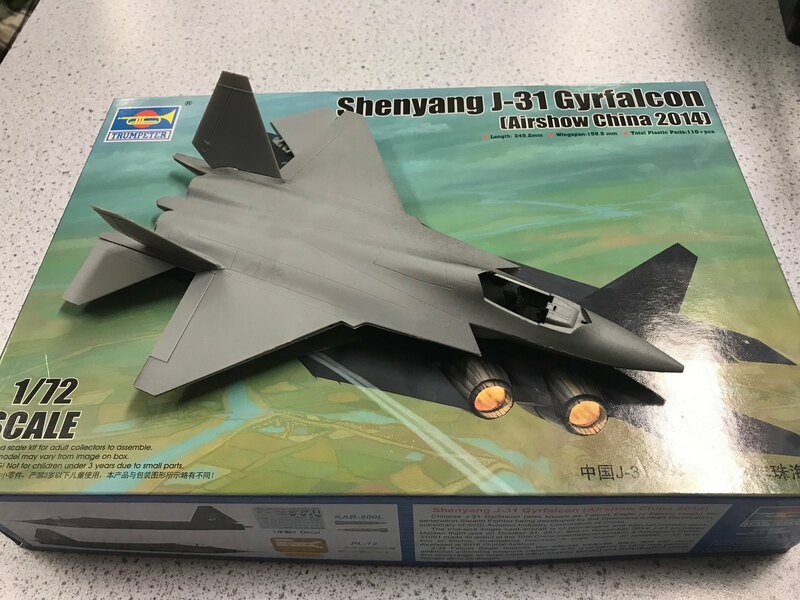 Though, for some reason, it comes in a box which is not divided up like a lot of their kits…despite the fact it’s pretty much the same sort of size as the J-10. Disregarding this fact, the kit is still well presented and parts perfectly protected. Construction seemed like a much simpler affair, whilst still having a good amount of detail. The fuselage came in 2 halves split horizontally. The undercarriage bays and weapon bays were actually surprisingly simple and slotted straight into place. The parts seemed to fit together very well in the initial dry fitting. If you’ve built any modern jets before, the construction will come very naturally to you. The wings have a slightly weird construction. With the rear flap/control surfaces slotting in place, and the leading edge of the wings also slotting in place. I have seen it on other aircraft, but it felt relatively unusual. I also found that the leading edge of the wing wouldn’t sit completely flush regardless of what I did. Whilst the model is sitting it isn’t actually noticeable, not unless you shine a light through it. By the time I realised it was too late anyway – so I left it as it was. The aircraft was not as big as I expected either. 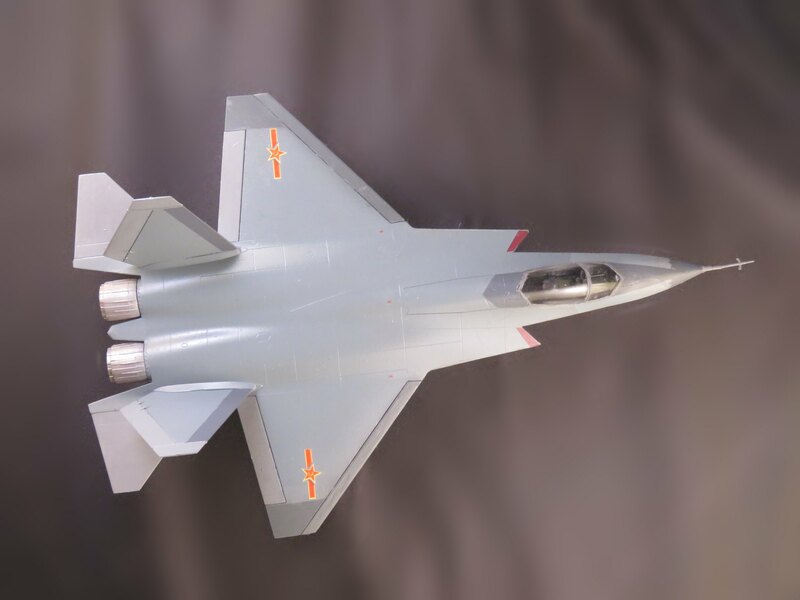 For some reason I expected it to be closer to the size of the J-20. 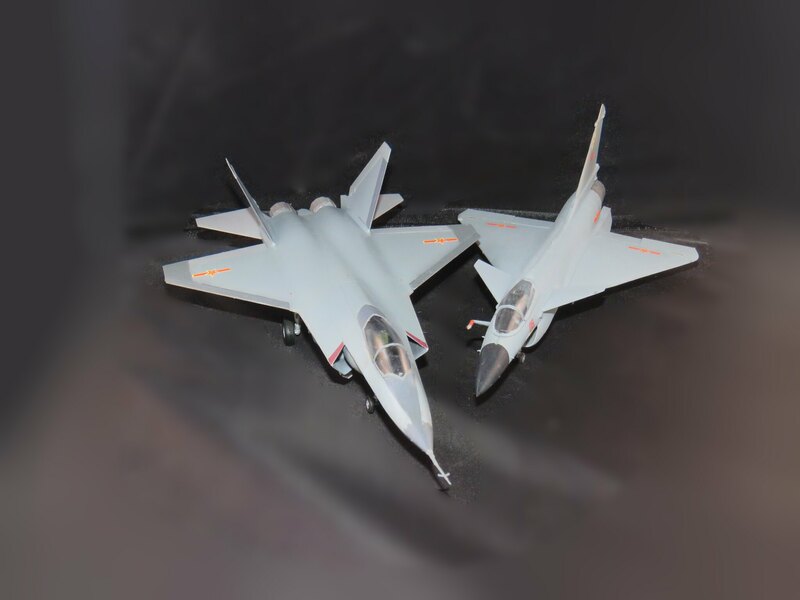 In actuality, it was ratty much the exact middle ground of the J-10 and J-20. Makes sense really, the J-10 is like an F-16, the J-20 is a tactical strike aircraft/stealth ‘fighter’, and the J-31 is the Chinese JSF. Well, without V/TOL. Apparently that aircraft will be based on the Yak 141. Painting was a bit bizarre. As the aircraft hasn’t really been seen outside of it’s black-scheme airshow appearance, it’s “in service” scheme is relatively unknown. I took the scheme that was shown on the guide and took a few liberties to just get something that looked appealing. 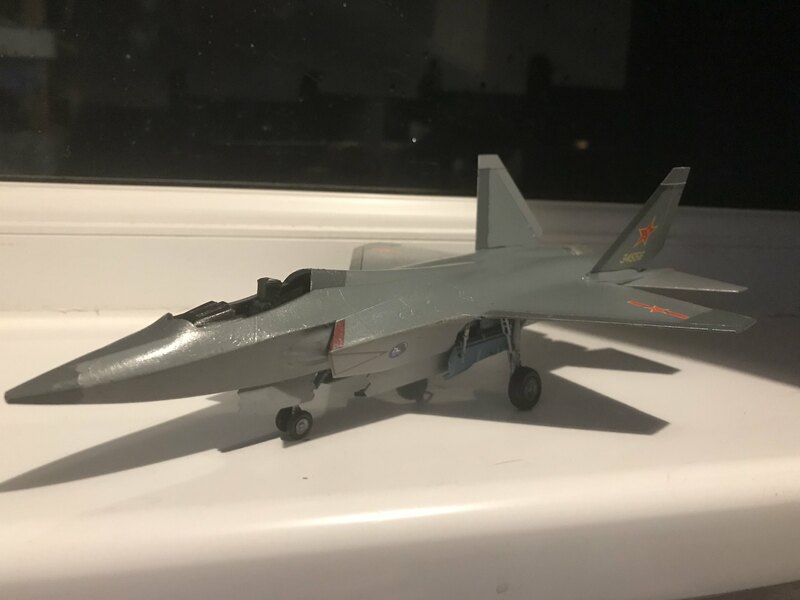 I ended up using the same main colour which I used for my J-10 (Vallejo Blue Grey Pale) and then used the kit paints for the remainder, except the dark grey which I used Revell 47 (Mouse Grey). The inside of the wheel wells didn’t appear to have a colour, so I just mixed one up. I went for a lightish blue that I found when looking at some Russian and Chinese aircraft, but ultimately I’m not entirely sure – there’s nothing really I can reference right now – so I just went for what looked nice to me! Sitting on my windowsill, whilst the gloss varnish dried. I used the decals from the box, and again took some artistic liberties. The eagle decals were present on the airshow livery…and so I took them and adopted them to my ‘service scheme.’ Otherwise I just used them exactly as prescribed by the paint scheme, and I like the result. It looks quite nice alongside my J-10, and on it’s own just looks pretty smart. The underside of the model features a weapons bay which you can have open or closed. I opted, for pretty much the first time on any of my models, to have mine open. I didn’t go that crazy, I literally bunged in 2 of the stock missiles sprayed white and called it a day. But it still looks decent. For someone who cares more about armament, I can tell this would be fantastic. It’s laid out incredibly well to allow you to get your perfect loadout. This kit was a pleasant surprise. It was my second Trumpeter kit that I’ve finished entirely (though not my second assembly), and my first aircraft of this style. I thoroughly enjoyed the build from start to finish. It was simple, but not boring – which is a really fine line. 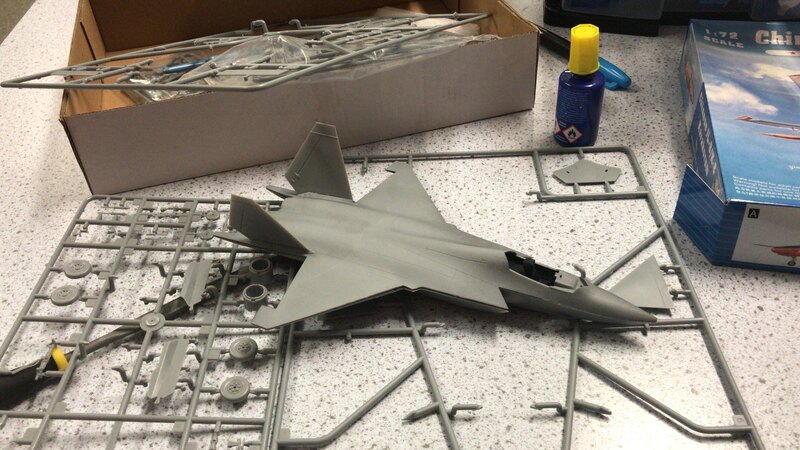 It was a really rewarding model, and I can’t wait to build an F-35 to go alongside it! Before you view the next image, excuse me for the poor image editing. I’m still learning image editing and did my best to show my J-31 with my J-10. Good work, Lexi. I look forward to seeing this in 1:144, as Dragon (or Trum?) have produced a J20 already. I didn’t buy it, as it looked hideous, but I might. I’m partic impressed with your comparison photos of J10, J20, J31. I’ve not done 1:144 really – I find it too small. I think it’s cool for dioramas, but as actual models I don’t find it enjoyable (for aircraft of this size anyway). 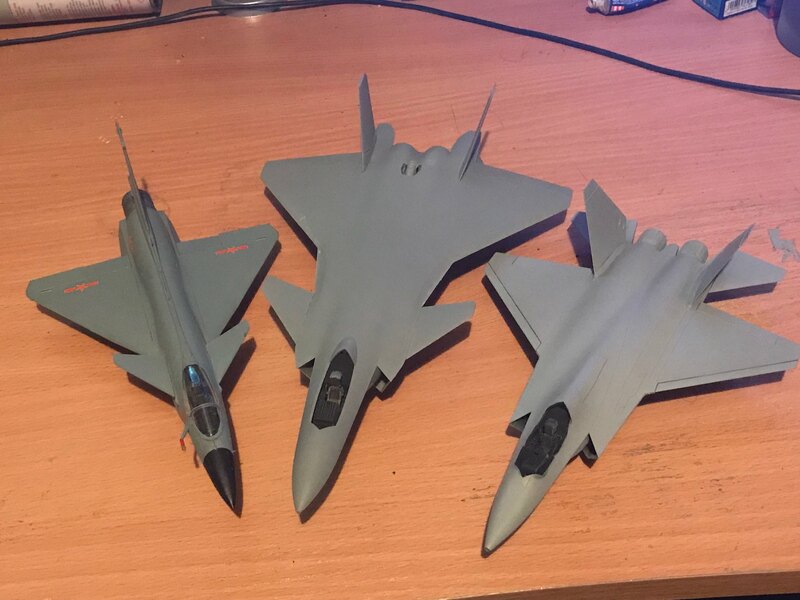 I will get pictures of all of them together once I have my J-20 finished – so keep any eye on here, as it’ll be in my J-20 article hopefully.